The Queen is back! 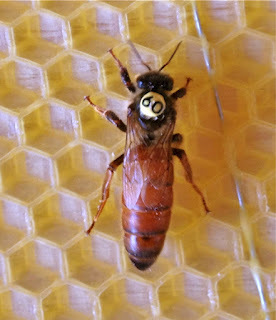 Not HRH Queen Elizabeth, but our own queen bee in our 5ft glass observation hive. In celebration of the Queens Diamond Jubilee, 60 years of the Queen’s reign. The Hive Honey Shop have crowned their queen with a special yellow crown ’60’. Visitors to The Hive Honey Shop can gaze into the busy secret world of the honeybee, watching as they freely go about their business gather honey from local Clapham flowers. Everyone is welcome to pop by and see if they can spot the queen! There is no charge and children are welcome with an accompanied adult.